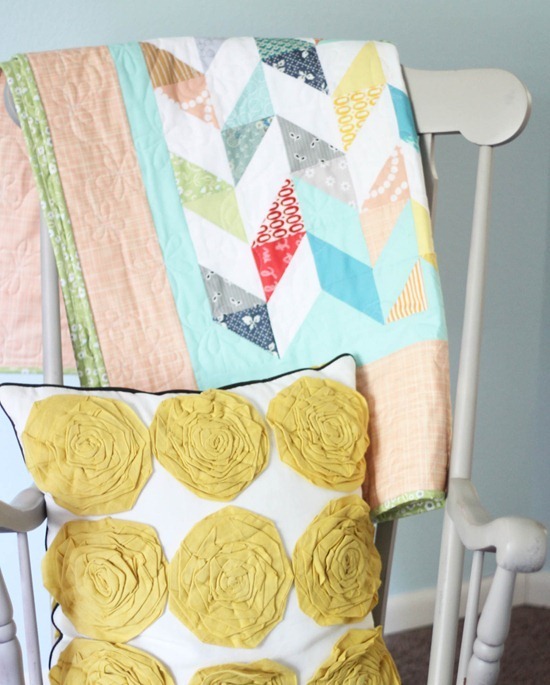 This little quilt is so fun to make…not to mention a great scrap-buster. I figured I better come up with a better name than Coral + Triangles (naming is not my forte remember? )…but a little bit pink with some bright scrappy edges? Sweet n’ Sassy it is. Here is a quickie pattern if you want to make one. It finishes at 38″ x 44″. 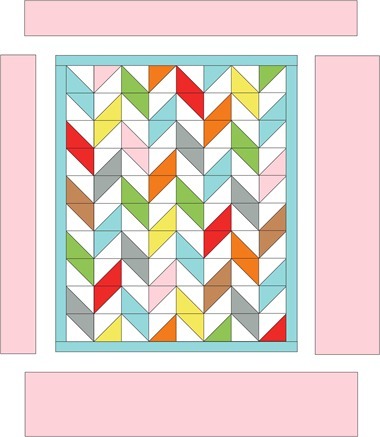 Keep in mind that I don’t leave room for squaring up these half square triangles…so if you like to square up your blocks (there’s a good tutorial here), start with 4″ squares instead. 40 squares 3-7/8″ each. In my quilt I used 7 colors, and 6 squares of each color…repeating some of the same prints. (I used white + aqua): 40 squares 3-7/8″ each. Or use a 1/2 yard, and cut the 1/2 yard into 4 strips 3 -7/8″, then sub-cut the strips each into 10 squares 3- 7/8″ x 3 -7/8″. Inner border fabric: 1/4 yard. Cut into 4 strips 2″ x width of fabric. Outer border fabric: 3/4 yard. Cut 2 strips 4- 1/2″, and 2 strips 7- 1/2″. Backing: 1 -1/2 yard, non-directional print. Binding: 3/8 yard. Cut into 5 strips 2- 1/2″ x width of fabric. 1. Draw a pencil line on the wrong side of each print square. Place a background and print square right side together, and sew a scant 1/4″ from the line on each side. Trim along the pencil line. Press seams gently towards the print or open. I starch the heck out of mine while I press…you’ll be glad later! 2. Trim off the seam corners with scissors or a rotary cutter. If your squares are un-even or not all of the same size, square them up to the same size (approx. 3- 1/2″, but it’s OK if you need to square them up smaller). Repeat until you’ve made 80 half square triangles. 3. 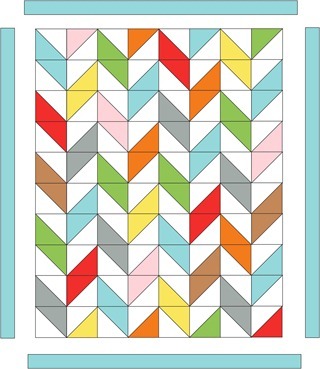 Arrange the half square triangles in 10 rows of 8 blocks each, matching colors together as desired. Sew the blocks together into rows, press seams of row 1 to the right, row 2 to the left, row 3 to the right, and so on. 4. Sew the rows together, press seams in either direction or open. 5. Measure each side of the quilt center, take the average if the two numbers differ, and trim an inner border strip to that length. Pin and sew the inner border strip on each side, press out. Repeat with the top and bottom inner border. 6. Measure each side of the quilt and cut an outer border 4 -1/2″ strip and a 7 -1/2″ strip to that length. Sew the 4 -1/2″ strip to the left and the 7 -1/2″ strip to the right. Press out. Repeat with the top and bottom border, using the 4- 1/2″ strip at the top. 7. Press out and done! 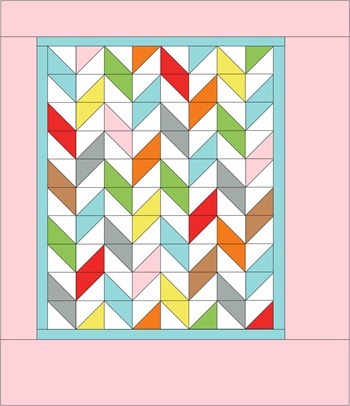 If you need help finishing your quilt there is a PDF you can download here. It is gorgeous, thanks for sharing! its adorable, thanks for the tutorial!! Hi! Your quilt is beautiful! I made almost the same using only solids with white. I made it wall quilt and mine doesn't have borders. I love it! 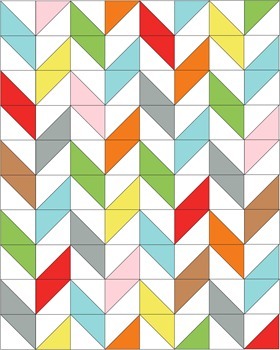 Also a great pattern to use up leftover half-square triangles. Thanks! Thanks Allison….not doubt there will be the need for a baby quilt sometime in my future, although a scrappy lap quilt would be good too. Thanks again. Great quilt! Thank you for sharing the very clear tutorial. It always amazes me how versatile HSTs are. This will be the perfect sollution for the half squares in Suburbs!! Thanks so much for sharing. :0) My pattern arrived Sat. Thanks Al! thank you! I love,love,love the pillow in the picture. Is that one of your patterns? Or could you direct me to it? What a cute pattern. Thanks for sharing! thank you a lot for the pattern! Very nice of you to take the time to write a tutorial . Thanks. It's perfect for a little one. Thank you! 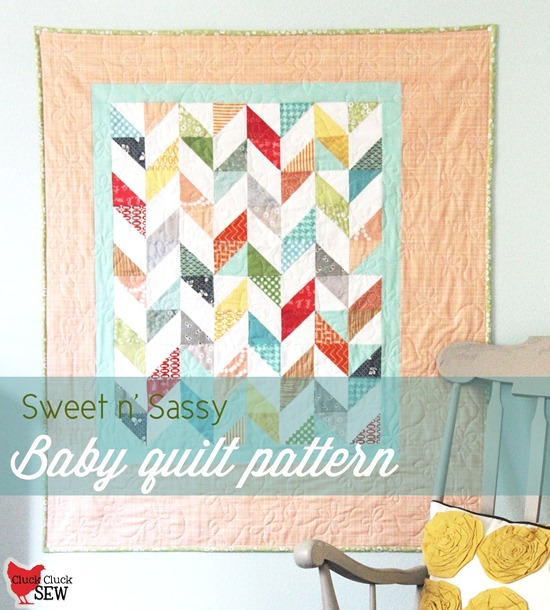 I need a baby quilt (fast) and have been searching for the right pattern. Thanks to you, I think I just found it!!! Yours is BEAUTIFUL, thanks for sharing!! So sweet and BEAUTIFUL. This is perfect and seems for doable, even for me! Thanks, can't wait to get started. Love this pattern ~ thanks so much! Dear Allison, your work is beautiful. Thank you for this lovely blog and all the lovely things you share with us. My best wishes to you and your family. It's "sew" nice of you to share ! Thank you Allison. very sweet! thanks for the pattern – you're always so generous! I've been wanting to send you a comment telling you to check out the game Q Bitz (if you haven't already seen it)…it's great for quilting inspiration. My 6yo and I LOVE this game! It makes me feel all happy and quilty inside. They also have an "Extreme" version, but it involves a lot more curves and I'm not sure I'm that brave. BTW, did I ever tell you your blog, which was the first quilt blog I ever found, spoiled me for most other quilt blogs because your patterns & colors suit me JUST SO? I have always loved you choice in colors! Wonderful! I would certainly enjoy winning this book. I just noticed you have over 7000 followers on your blog! I think this makes you the biggest blog I follow, and yet I always get a response from you to my comments! Thank you for doing so, to little old me here in Australia. I do love your patterns and have purchased quite a few but yet to have time to make one up. Thanks for the free pattern and instructions! Thank you so much for taking the time and write up the pattern for sharing with us! I will definitely try this out. Just looking at it makes me wanna grab my stash basket and start right away! Love it, thanks for sharing. I like all your quilts. Thanks for sharing the cute pattern. Hello, Allison, nice to meet you. My first time here on your amazingly beautiful and information-filled blog. I have subscribed in my google Reader and will do so with Bloglovin-which i think is what I'll use if Google insists on closing that Reader. I love your clear and concise tutorials; sharing is caring and I love that you share your knowledge and skills with the rest of us. Many thanks. This is such a clear and well done tutorial. I love working with HST's and I love the pattern layout. I am wondering what software program you use to make the diagrams of your pattern? Is that a quilting program or is it something like photoshop? I'm looking for something that can do this, but don't know what to look for! Thanks again for the wonderful pattern! So pretty, and really versatile! Thank you!! I have some really ugly multicoloured fabric that I cut up into triangles a looong time ago then forgot about- I'm thinking this is the perfect way to use it up so that it doesn't dominate whatever pattern it goes into (and actually ends up looking good!). Thanks to this wonderful tutorial, I just made my first quilt. I love how it turned out and so does my daughter, the recipient! Thank you so much! Sarah. Hi, I was wondering if I could use a charm pack with this patten? Are there any adjustments I would have to make to the measurements to accommodate that? Any chance you have a tutorial for that lovely yellow flowered pillow?? Having a very hard time getting the details on yardage & cutting instructions. Would it be possible to email this tutorial? It looks like such fun to make for a little one. Thanks so much. LOL thank you Sharlyn! I’m honored to have my own category!